0.75mm 3 core crystal clear FEP/PVC flex designed for use on multicore electrical applications such as lighting, extractor fans etc. 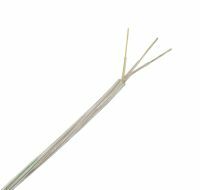 This round flex has two transparent conductors and one transparent conductor with a co-extruded green stripe. This cable needs to be installed by a qualified electrician, as a multimeter will need to be used to correctly identify the live / neutral conductors. Sold by the metre, if you buy more than 1 metre, you will get all your cable in one big length (up to a max of 50m). eg, buy a quantity of 5 and you will get a 5 metre length of cable.